This souffle type cake is great as it can be prepared in advance and served cold but if you prefer a hot dessert, go ahead and serve it straight out of the oven. The texture is best descibed by Tartelette as part cake, part custard and part souffle. The cake can also be made gluten free by substituting all purpose flour with sorghum flour. This will store well in the fridge covered for up to several days. I only had two slices left but I felt it somehow tasted even better the next day- almost as though the almond flavour had intensified, the fruit was chewier and the cake denser! 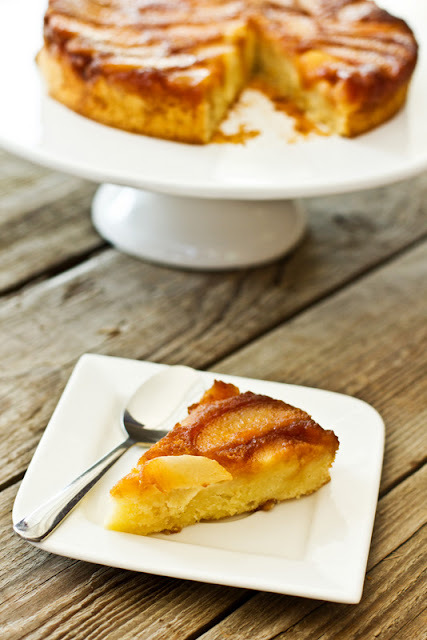 This cake is great for a cold winter night- there's just something about apples and pears that make you feel all warm and fuzzy don't you think? 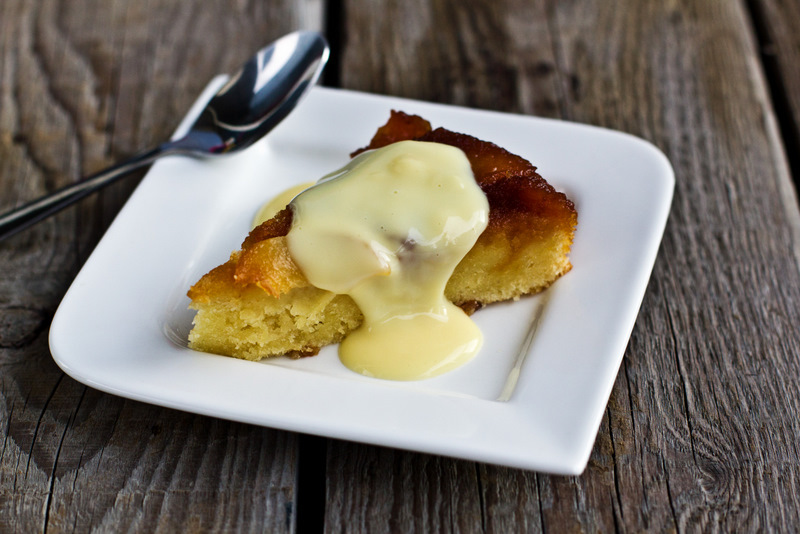 We served this cold with a drizzle of custard, although you can also serve with a dollop of cream. Preheat the oven to 175 degrees Centigrade. Grease and flour an 8 inch pan. Arrange pear slices in a uniform fashion at the bottom of your cake pan. Heat sugar and water in a saucepan without stirring. You can swirl the pan to aid in mixing until a light amber color is achieved. Don't overcaramelise as this will make the topping hard and bitter. Pour this topping evenly over pears. Using the paddle attachment on your stand mixer and at medium speed, beat the sugar and butter until light and creamy. Add eggs one at a time, beating well after each addition and scraping the bowl when needed. Reduce the speed to low and add the rest of the ingredients. Pour batter over the pears and bake for approximately 30 minutes. The skewer will come out almost clean when done. Let the cake stand for 5- 10 minutes on a rack and say a prayer before turning it out. This recipe will serve 12 people. Spectacular! what a good looking dessert plate. I love it that you added almond flour. And fruity desserts are so my kind, and I do think this would taste better the next day. I do so agree about pears and almonds together - divine. And you mentioned custard....heaven! 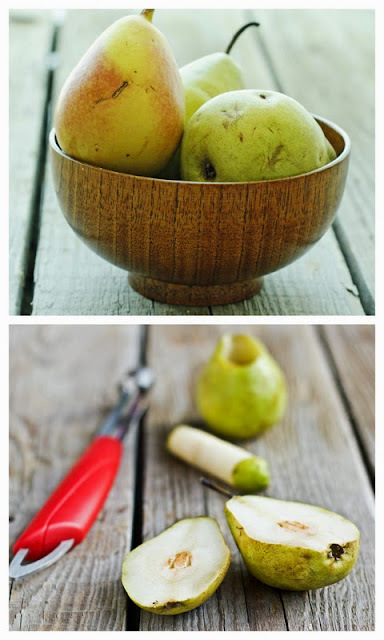 Pear and almond are classic flavors. I love this cake! Quite right, pears and almonds do indeed have an affinity for each other. This reminds me of the kind of cake my grandmother used to make when I was younger. 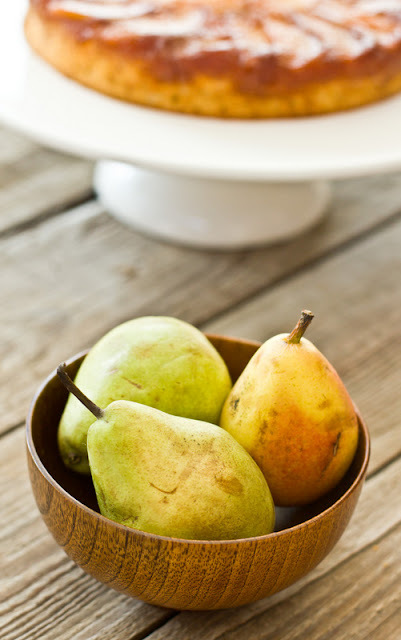 Almond flour is my latest craze.This cake looks wonderful.I love the beautiful golden color of pears sitting on top.Your pictures are stunning..the last one with custard stole my heart. Wow, what a beautiful dessert! Look so great! 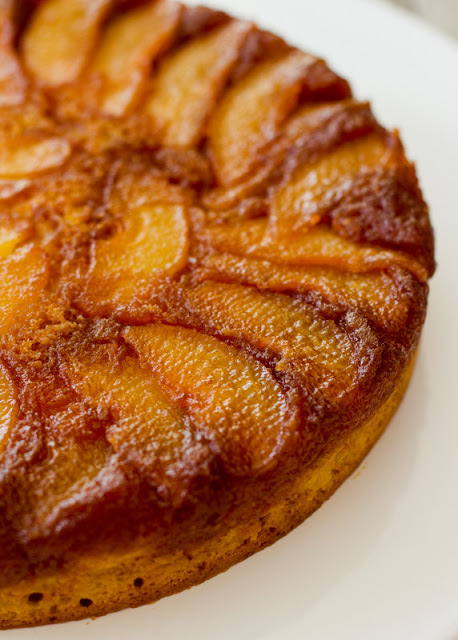 I absolutely love fruit in baking...and this cake is wonderful in every way. Gorgeous!! This looks divine! As a side note, you are an amazing photographer! Thanks for the great comments everyone......really enjoy reading them! We made this for some family friends last night and it was fantastic! Making the caramel was a bit of a disaster and the cake didn't look as beautiful as in your photos, but it came out wonderfully- very moist with great flavors. Thanks for sharing! Hey there.....glad it turned out ok and everyone liked it. Making caramel indeed is a bit of hit and miss for me as well. One trick that helps me is that I never stir the mixture and rather, just swirl the pan. APPARENTLY it helps! So i guess I'll try this out tonight. I like your style of photography ....your pictures look lovely. Delicious! Moist but light. I live in California's central valley and my local produce stand has bags and bags of pears. Since we couldn't eat them all, they are overly ripe and this recipe put them to good use. I used whole wheat flour instead of white and it is so good (can't tell it's wheat!) and used 1/2 vanilla & 1/2 almond extract since I just ran out of vanilla. So good! Thanks for this quick, delicious recipe using riped fruit!